Parking tickets must be paid within 14 days. Failure to pay a ticket will result in prosecution in the Provincial Court of Alberta. We accept payment in Canadian dollars. 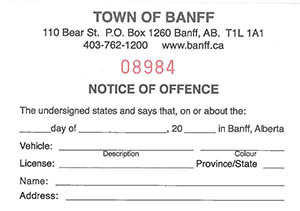 Are you paying a Town of Banff violation ticket? 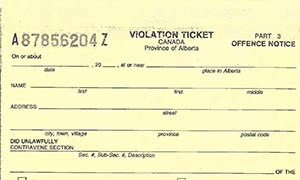 A Town of Banff violation ticket is white and is identified as such at the top of the ticket. You can pay this ticket at the Town of Banff. A provincial violation ticket is yellow and is identified by country and province. You cannot pay this ticket at the Town of Banff. 1. Online: here using Visa or Mastercard. Include your ticket or record your ticket number on the cheque. Post-dated cheques must be dated no later than the due date. Your payment must be postmarked on or before the due date to avoid late payment charges. Monday - Friday from 8:30 a.m. until 4:30 p.m. Include your ticket or record your ticket number on the cheque. Post-dated cheques must be dated no later than the due date. Your payment must be postmarked on or before the due date to avoid late payment charges. If you wish to appeal a parking ticket, you must complete a Parking Ticket Appeal Form.